Remember that scene in Pretty Woman, when Julia Roberts has her hand snapped by the Cartier jewellery box and those gorgeous red lips of hers curl up in laughter? Or Marilyn Monroe in hot pink satin, her beautiful smile lighting up the screen in Gentlemen Prefer Blondes? Madonna’s red pout in Desperately Seeking Susan? At Living Nature, we believe every woman should have the opportunity to experience the glamour of red lips without the guilt. Our red lipsticks are certified organic and not tested on animals. The red pigment is plant based; Melia Azadirachta (Neem) and Coccinia Indica, both of which have bioactive and therapeutic functions. We’re making great products that make you look and feel naturally beautiful. It’s the most enduring of all lip shades. Women have been finding inventive ways to colour their lips for thousands of years. Think Cleopatra, Elizabeth I, Marie Antoinette, Coco Chanel and Marilyn Monroe. The technology has improved but the appeal of luscious, red lips has always had a loyal fan base. It’s the easiest way to feel glamorous. There are so many clichés about red lipstick and they’re all true. Red lipstick is all things to all women. Vampy, provocative, chic, dangerous, alluring. It is to makeup what the Little Black Dress is to fashion. Need to quickly dial up your glam? Consider your Living Nature lipstick a faithful companion. Red lips say “Here I am and I mean business”. A good red lipstick makes a statement even before you say anything. It announces to the world that you are bold, confident, and successful. It’s a strong look that takes an equally strong personality to pull it off. You are no shrinking violet or fading wallflower. Make your statement with your favourite red Living Nature natural lipstick. Or Pure Passion; a rich deep matte red with a subtle crimson undertone. Perfect for night-time and a ‘must have’ lipstick that adds a little bit of glamour and natural elegance. Choose from Wild Fire; a warm classic matte red, with an orange undertone that can be worn day or night, anywhere and everywhere. Living Nature emulates the same natural ingredients that were used to colour lips thousands of years ago. Our lipsticks are produced, in small batches, hand poured and individually flamed to a perfect finish by our experienced team at our Kerikeri, New Zealand home base. Each lipstick receives the quality assurance you would expect from a Certified Natural, plant-based skincare line. All natural pigments and nourishing waxes ensure smooth application, fabulous wear and a gorgeous natural smile. 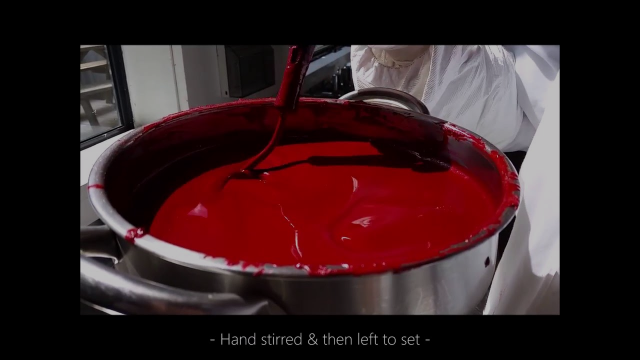 See how our 100% Natural and Certified Organic Lipsticks are made.